http://www.shar.gov.in. Search for desired job and submit application before 08-12-2017. Notification has released on 16-11-2017. Candidate must have qualified SSC/ SSLC and ITI/ NTC/ NAC in relevant trade from NCVT are eligible for the current recruitment. Maximum age limit is 35 years and minimum age limit is 18 years. Candidates will be selected for SHAR- ISRO Technician vacancies based on their merit in written test/ Interview. 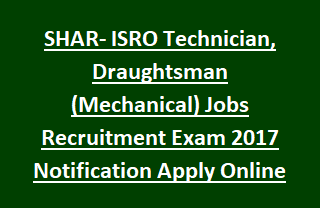 Find the details regarding application procedure, Important Dates, Age limits, Selection Process, Pay Scale, Educational Qualifications of Satish Dhawan Space Centre (SDSC) SHAR- ISRO Recruitment of 68 Technician, Draughtsman (Mechanical) vacancy details are mentioned below. Total vacancies available in SHAR- ISRO Recruitment Notification are 68 posts. 2. Draughtsman (Mechanical): 01 post. Pay Scale for the vacancies in SHAR- ISRO Recruitment is Rs. 21,700/- to Rs. 69,100/- per month. Age of the candidate applying for ISRO Technician Jobs should have Maximum age limit of 35 years and minimum age limit of 18 years. Please go through the ISRO Notification for Age relaxation details. Technician: Candidate must have passed SSC/ SSLC and ITI/ NTC/ NAC in relevant trade from NCVT. Draughtsman (Mechanical): Candidate must have passed SSC/ SSLC and ITI/ NTC/ NAC in the trade of Draughtsman (Mechanical) from NCVT. See the notification for full details. SHAR- ISRO will conduct written examination/ Interview for recruiting candidates for Technician Jobs. See the ISRO notification for selection process details. Candidates having required qualifications may go through the SHAR ISRO official website http://www.shar.gov.in/sdscshar/index.jsp. Log on the web link and search for desired job. Read the Notification instructions to fill the application. Upload the application with necessary documents before 08/December/2017. Go through the notification for detailed application procedure.